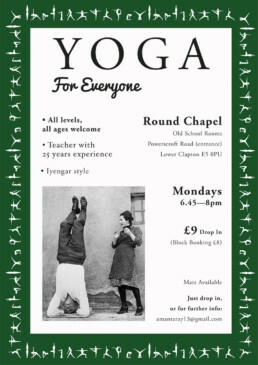 Yoga for Everyone – Monday night yoga class in The Old School Rooms. Anyone can join in this open level class taught by experienced yoga tutor Amanda. Yoga mats, blankets, blocks and belts are all available. The large hall is warm and welcoming, and many local people have enjoyed the benefits of these sessions over the last ten years. Drop in £9. Block booking £8. Feel free to just drop in and try a session.